Is It Worth To Attend Event Like DevCon Summit? In every expertise, their’s always a group of volunteers who are willing to share their ideas as a give back without expecting any return. On my side, there’s a community called Devcon. One day, when I was scrolling in social media I found the ads about DevCon Summit event near in our hometown. It’s really interesting but there’s always doubt back on my mind, Is it really worth to attend? I mean, this is a 1-day whole event. am I willing to exchange my 1-day workload for this summit? Even my friend also asks me that question so here’s the breakdown of the pros and cons of attending an event like DevCon. If you’re a business owner related to the tech industry and looking for manpower, I encourage you to participate as a sponsor. Theirs’s a lot of ideal candidates and connection who are willing to help you out. They will tackle topics that are helpful for aspiring developer. From Mobile Development, API, Cyber Security, Blockchain and many more. Although it doesn’t involve hands-on coding, at least their giving the fundamental insights. Aside from T-shirts and cute DevCon bags, There’s a lot of souvenirs especially if you have participated in their Q&A. Lucky I got a lot of them. More opportunity for aspiring developers. I even see sponsors who are giving FREE training, just to help you become competent. It will help expand your network in your industry. If you are looking for something a hands-on practice then this is not for you. Basically, this is a pure essential chit chat talk. It’s not FREE though I would say that your ticket is still “SULIT” because they do have a lot of giveaways. See all the giveaways we’ve got. This is once in a blue moon event so better to attend. 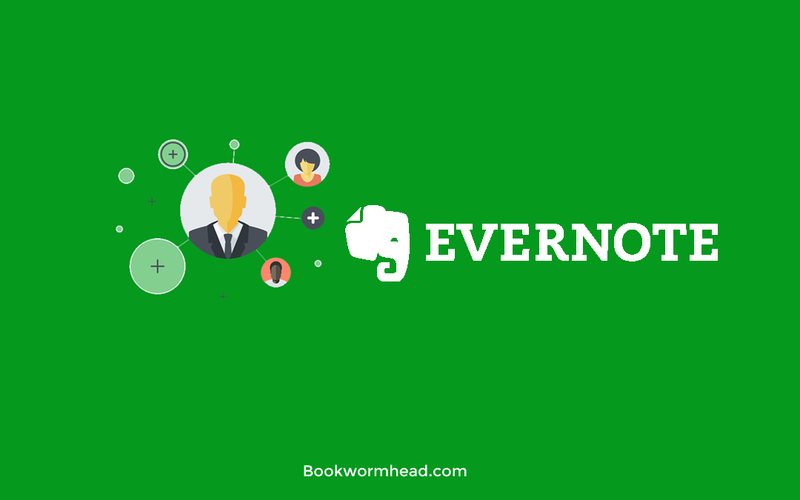 There’s a lot of password management tools available throughout the cloud but neither of them quench my thirst until I come up with this 101 Evernote tips and tricks that dramatically improve my productivity rate. If you are wondering why I shouldn’t be using Lastpass or Sticky Password? Actually, I tried but…. I cannot afford the glitches and it’s eating my precious time so instead of dealing those stuff; I created my own password storage that works both in offline and online – even in Incognito browser..
Sign up at Evernote and create a group for your client’s information. 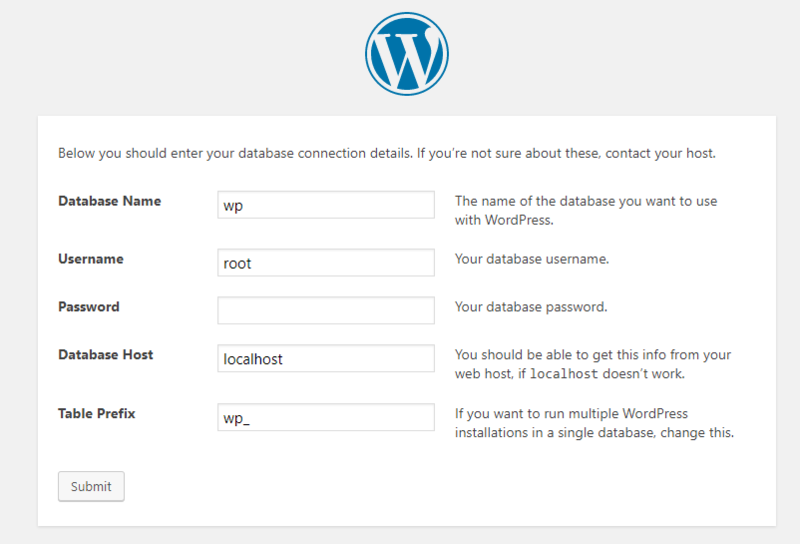 This help you to locate login details easily. First, create a stack to merge the notebooks( Independence Title create a very brief tutorial how to create a stack in Evernote). I have the Evernote notebook called default contacts where I put all the clients that focuses only on their business which means their login details are exclusively all about their company. Step 2 – Evernote Tips 101: Create A Note(s) Inside The notebook And List The Login Details from A to Z.
Add-on Evernote tips: Consider creating notebook if your client has a lot of customers that you are dealing with. See how I did it on Johnny’s info. 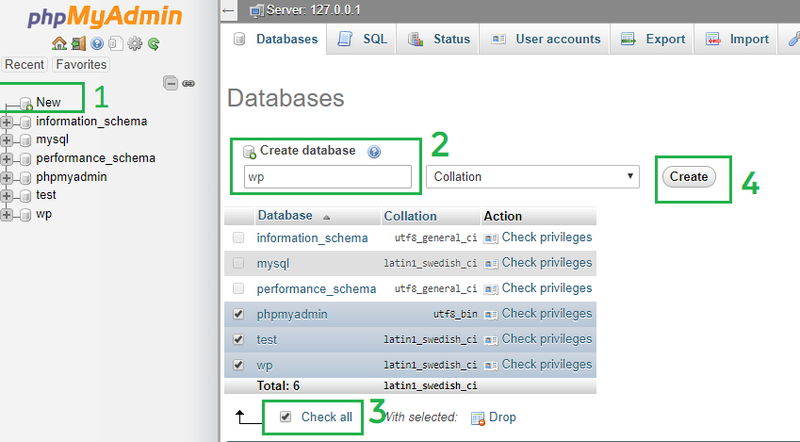 Create a notes by clicking the paper icon for your client’s login details. 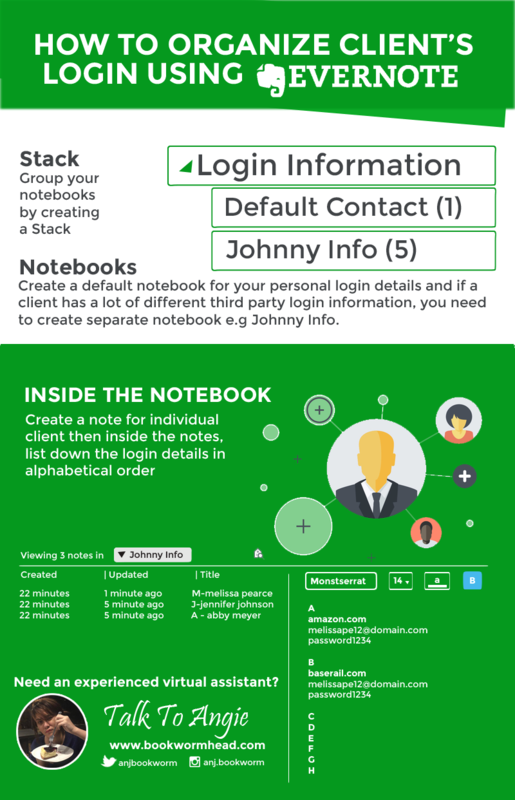 For clients similar to Johnny, you need to create individual notes for every client. PS: this is just a dummy names. How the notes look like? Listing your login details from a to z is searchable so rather than categorizing them, why don’t you try the traditional a-z way? Why I choose Evernote instead of others? What I really like about Evernote is.. it’s very user-friendly and you can even download the app on your smart phone. Even though, it’s a cloud based tools; the autosync function allows you to add and edit some notes when you’re offline. Do you want me to create a step by step video tutorial about organizing client’s login information using Evernote? Comment below or drop me a message! Thailand is the most pron visa run country for digital nomads and as a first timer, this is quite scary. So way back 2016, I decided to travel to Thailand to study a microblading. It’s actually tough decision because it was my first time to stay away from my comfort zone yet an exciting moment. 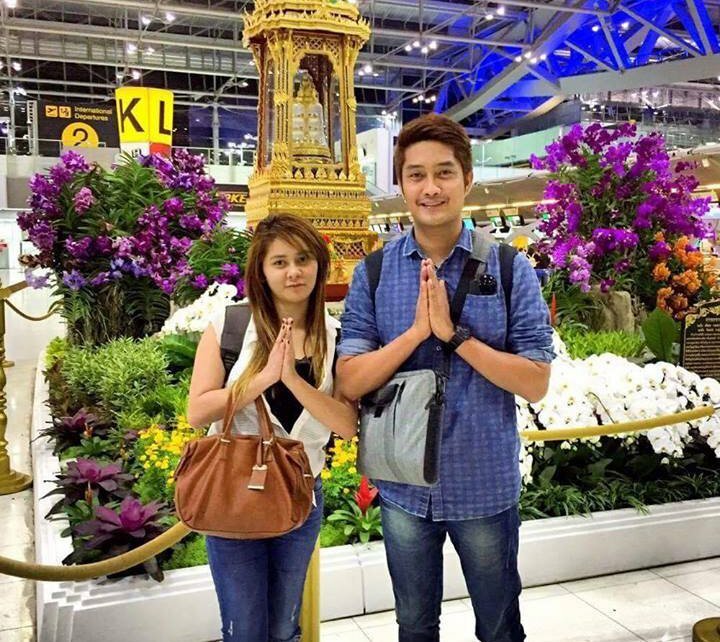 Traveling from the Philippines to Thailand doesn’t require a visa up to 30 days but since there’s a lot of Filipinos work illegally, the “offload” word brought to our attention. Don’t carry too much luggage – Based on my perception, carrying over-sized luggage as a tourist doesn’t make sense at all. You’re just hinting the immigration that there’s something smelly on your travel. In fact, we haven’t bring anything but our laptops and backpacks with a total of 3kls. But heck! Don’t follow us.. Anyway, you can get as much as 7kls to 15kls luggage..
Be Confident if they ask – Just be confident, do not give anything unless they ask. I noticed some Filipinos are too defensive. Psychologically speaking, if I am the immigration officer, I will also feel overwhelmed. So tip of advice: Do not speak until they ask you do so. How long you will stay in Thailand – Be concrete, do not throw unsure words like “Maybe 15 days”. Just say “15 days”. If they ask you a returning ticket; just say you haven’t book yet. If you’re not comfortable, you can buy a returning ticket. For hotel accommodation alternative, you can find cheap rooms in Bangkok here. Make sure you’ve tick the lowest price. Keep in mind, the key is just BE CONFIDENT. Just write down the complete address and contact number. But honestly, it rarely happens. Please, don’t give them a TOR or any school documents. That’s a huge red flag. You will travel as a tourist not other way around. If you follow these step above, they will not bother to ask anything but just your passport unless you will look suspicious…. so just chill. FYI: * This all works in all countries. Fashion kills you – don’t be too fancy nor dull. Just mediocre. Plus points: Having a lot stamps on your passport is a big plus. So we arrived in Thailand and the microblading journey begins… until we figured out that the return ticket is not total of 30 days but 31 days. Worst thing, you only have 29 days to stay in Thailand because the “date on arrival” is counted, that’s equivalent to 2 days overstay. At first, we planned to travel in Cambodia to get a 15 days extension but shits happened and I am so exhausted both to my work (I’ll be posting how to work online soon!) and school (I’ll posting microblading 101 soon) so we leave it as is and expect the unexpected. Despite we went to the Thailand immigration located at the first floor of the Suvarnabhumi Airport (BKK) and asked for assistance on how we can fixed the problem without messing up our passports. The immigration officer was so friendly and told us that all nearby Asian passport holders have a 3 days grace period so luckily we saved 1,900 baht penalty/person. Note: If you’re staying more than 32 days, you can either do a visa run before the expiration at the nearby countries like Cambodia or Laos.